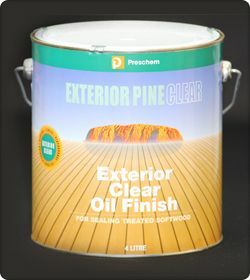 EXTERIOR PINE CLEAR is a clear decking oil type exterior timber finish specifically formulated for use on treated pine. It takes away the normally dry treated pine look and its penetrating qualities give the timber a rich natural oiled look, which enhances the natural grain and beauty of pine. It also has a powerful MOULDICIDE which prevents mould growth, timber blackening and discolouration. Wood finishes such as EXTERIOR PINE CLEAR are naturally water repellent, which help stabilize the timber and reduce checking and movement thus overcoming many of the problems associated with using pine in service. EXTERIOR PINE CLEAR can be used wherever a clear protective exterior timber finish is required for treated pine e.g. cladding, decking, pergolas, trellis and fencing etc. It is suitable for all treated softwoods such as Radiata Pine and Slash Pine and Oregon. Apply EXTERIOR PINE CLEAR over dry surfaces, free from dirt, grease and wax. Previously varnished or painted surfaces must be thoroughly stripped. Badly weathered surfaces should be sanded back or cleaned using a suitable wood cleaner containing oxalic acid such as Preschem’s GREY DECK CLEANER or similar before application. Apply the oil via brush, roller, spray or dip application. Apply one generous coat of Exterior Pine Clear and allow a minimum of 24 hours drying time. Timber treated with Exterior Pine Clear will not blacken when maintained regularly. However, over time and depending on the severity of exposure, the colour of the treated timber will fade. Repeat applications are simple as the timber can be re-oiled to bring back the timber texture. Areas which wear due to heavy foot traffic e.g. decks, doorways, steps, etc, can be touched up when necessary. Avoid skin contact by wearing protective clothing. Don’t breathe vapour of spray mist. If poisoning occurs, contact a doctor or Poison Information Centre (13 11 26). Hold eyes open, flood with water for at least 15 minutes. Remove contaminated clothing and wash skin thoroughly with soapy water. Remove to fresh air. If swallowed, DO NOT induce vomiting. Give a glass of water to drink and transport to hospital.